In 2016, Indianapolis Mayor Joe Hogsett announced a renewed dedication and commitment to the city’s workforce development. A new mission and strategic plan for EmployIndy emerged, and it was soon clear that the website did not reflect this new vision. They were looking for a new website that was bold and vibrant and did not use the cliche stock photography that was featured throughout the old site. 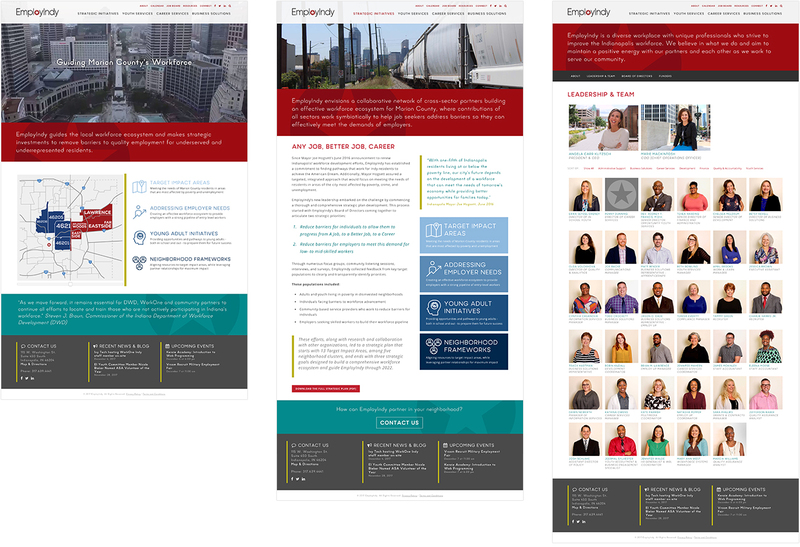 The vision for the new site included a bold color scheme and high visual impact. Custom photography replaced the standard stock photography from before. The site’s structure and content were reorganized and rewritten to better reflect the new direction of the organization. The individual pages were created using repeating elements in such a way that each one is unique while still remaining cohesive. And by using advanced techniques in WordPress, EmployIndy can not only edit all these sections within WordPress (without needing to know any HTML), but they can also create new pages with these specific blocks of content. In additional to the custom, responsive WordPress theme, the site has some other special features and functionalities. Initially, EmployIndy targeted five specific zip codes. However, over time, it became clear it was specific neighborhoods that were the areas most in need of EmployIndy’s services. For that reason, EmployIndy wanted to have an interactive map feature that showed the zip codes from which they gather data as well as the targeted neighborhoods in and around those zip codes. The four new Strategic Initiatives also received special attention. Icons for each one were carefully chosen and are now displayed on the home page, the Strategic Initiatives page and in the dropdown navigation menu itself. The site also has a customized calendar that shows events across a variety of categories and is color-coded and sortable, so each audience can find the events that suit their needs. It was also important to have a Leadership & Team section that provided an overall directory of everyone’s name and photo. Using a filter to sort by departments, visitors can quickly locate the correct person. Full bios for each team member are also available by clicking on their photo or name. The EmployIndy site will continue to expand over the next months and year, and the custom WordPress guide that was provided will make adding new content and pages something that they can do using the instructions provided.